Olympic athletes tend to know a few things about training. After all, it’s not exactly easy to become an Olympian. Years of hard work must be performed to reach such a level. It’s even more difficult to compete in multiple Olympic games. Repeat performers not only display world class ability, but also longevity. With that in mind, Jordan Jovtchev is one of the most inspirational athletes you’ll find. He first became an Olympian in 1992. Twenty years later, he competed in his sixth straight Olympic games in 2012. When a six time Olympian talks about training, it’s a good idea to listen. Jordan Jovtchev has not competed at a world class level for so many years without knowing what he’s doing. If there was ever a reputable source for gymnastic training, Jordan’s name would certainly land towards the top of the list. The video below includes instructions for several ring training exercises. Jordan Jovtchev discusses and demonstrates the movements himself while also providing progressions for all levels. You don’t need to be a gymnast to benefit from the material. Many of the exercises will be useful for athletes from all backgrounds. 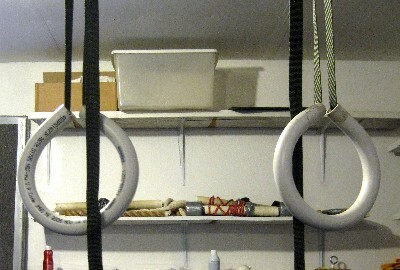 If you don’t have gymnastic rings, a homemade pair is not difficult to make. I first shared a ring tutorial back in 2011. Take a look at the link below for complete instructions. I still have the same pair of rings and straps. They’ve held up fine despite regular use. And while I am by no means a gymnast, I’m glad that I made the rings many years ago. I’ve certainly benefited from their use. I’ve also enjoyed the time that I’ve spent challenging myself with exercises that I would have never otherwise performed. Great content Ross! And perfect timing for me, I’ve just installted my home rings. Peace. I remember the post on the DIY rings and that alone was a great post. This video really takes it to the next level and I thank you for sharing. I installed my rings 4 weeks ago in an one-bedroom apartment in NYC; and I’ve enjoyed having them from day one. There’s no way to not jump on them when they’re in you’re living room. Competing in the Olympics at what was he 39? Nearly 40 years old. No small feat. Thanks for the read! Thumbs up for Jordan Jovchev – a humble and hardworking example for all of us. Jordan is a legend, having competed in 6 Olympic Games especially in a sport like gymnastics. He has my respect. I seriously advise people to include gymnastic ring training, you won’t regret it. They are one of the best training tool investments you can make. They are portable, cheap and you can have a fantastic workout with them.